Immediately after the body is injured, it starts the processes of stopping blood loss, restoring function, and preventing infection from pathogens on the skin or objects that may have caused the damage. The microenvironment of the injured area is in constant flux with the host cells continuously responding to the fluids, bacteria, and the dead and dying cells at the wound site. One of the first phases of the healing process is for circulating platelets to attach to a fibrous scaffold, a matrix, to stop blood flow. Platelets, recently defined as immune cells, release cytokines, immune messengers, which permit cells to communicate with one another. Once the flow of blood ceases, specialized immune cells enter the area setting up an inflammatory response that “cleans” the wound site and removes bacteria, damaged tissues, and foreign matter. In order to achieve the appropriate levels of inflammation, many complex cell-to-cell interactions occur in specific order. Accumulation of fluids, exudates, results from inflammation, along with swelling at the wound site. Exudates are essential for the healing process and contain debris, inflammatory cells, bacteria, and a large variety of immune proteins. Depending on their concentrations, factors may enhance healing or interfere with the process. Proteins found in exudates have a variety of functions including regulation of inflammatory responses, triggering growth of new blood vessels, and stimulating growth of new cells. A delicate balance of inflammatory and anti-inflammatory messengers is crucial and it determines the pace, and outcome of healing. Homeostatic, balanced, inflammatory responses are essential. Too little, too great, or too lengthy of an inflammatory response damages healthy tissue and delays healing. The remodeling phase is one where tissues regenerate and close the wound. Closure occurs as cells cross-link and organize themselves attaching to a scaffold, a matrix that will draw edges of the skin closed and cover the area. The presence of bacteria, foreign bodies, a lack of oxygen in the tissues, and/or fragments of necrotic, dead, tissue can stimulate inflammatory cells continuously, resulting in uncontrolled inflammation and wounds that heal poorly. Infection of a wound site also interferes with proper healing. Communities of bacteria tend to organize themselves into a biofilm, a thin sheet of bacteria. Biofilms increase survival of bacteria colonies, reducing chances that inflammatory immune responses, or antibiotics, can control them. Exudates in poor healing wounds contain an over abundance of inflammatory cells and immune mediators that increase inflammation. Sufficient anti-inflammatory factors to control the damaging effects of excessive inflammation may not be available. Proteolysis is another one of the steps required for healthy healing. This is an event during which the body degrades necrotic tissue, and dead and dying pathogens. [Think of proteolysis as an acid/enzyme reaction that breaks down tissues.] When immune cells release too many proteolytic proteins over a longer period, they become destructive of healthy tissue, and the body’s ability to heal the wound is overwhelmed. Individuals with non-healing skin ulcers, such as those found in diabetics, not only struggle with excessive inflammatory responses, but their proteolytic enzyme levels are significantly elevated giving rise to further imbalances in inflammatory responses and interference with the body’s repair mechanisms. The sensitive balance between stimulating and inhibitory mediators during diverse repair of wound is crucial to achieving tissue homeostasis following injury. Once unbalanced and excessive inflammation is controlled, will healing begin. There is no fee for speaking with Dr. Hellen. She may be contacted by using this form or at: 302.265.3870 (ET). Blood disorders are diseases that affect blood components: 1) red blood cells, 2) white blood cells, and/or 3) platelets. Red blood cells are disc-shaped cells that carry oxygen from the lungs to all the cells in the body White blood cells are immune cells that help the body heal, and protect itself from infections and cancerous cells that might grow into tumors or cancers of the blood. Platelets are blood elements that stick to the lining of blood vessels and help the blood to clot when bleeding from a wound. Some common blood disorders are anemia, thalassemia, sickle cell anemia, idiopathic thrombocytopenic purpura (ITP),pernicious anemia, hemolytic anemia, and aplastic anemia. All of these disorders have a single commonality, mainly that individuals with these types of conditions have low numbers of red cells, white blood cells, and/or platelets. Inflammation is necessary for our survival. Invasion by pathogens initiates inflammatory processes that attack these organisms. However, too often the “forest fire” gets out of control, and healthy cells, tissues, and organs are damaged. When the body attacks its own cells, the condition is called an autoimmune, against -oneself, response. Individuals with thalassemia often suffer from inflamed blood vessels and slower blood flow in their blood vessels. Both problems put individuals at greater risk of suffering from thromboembolism. In this condition, a blood clot, an embolus, partially or totally blocks blood vessels deep in the body (deep vein thrombosis) or a clot is released that suddenly interferes with blood flow within a lung artery (pulmonary embolism), which can be fatal. As blood clots form, an inflammatory response is triggerred to break up the clots. More inflammation results in the production of more cytokines, immune messages that affect blood clotting. Individuals with thalassemia, as with other blood disorders, typically have higher levels of inflammatory cytokines than individuals without such conditions. It never ceases to amaze me how many health practitioners ignore the contribution of inflammatory process to diseases such as thalassemia. In blood disorders, as with most other diseases, achieving and maintaining immune inflammatory homeostasis, balance, is essential. Being in homeostasis means that there are enough immune factors, pro-inflammatory cytokines to initiate a proper inflammatory response, and corresponding anti-inflammatory factors to limit inflammation and the damage it may cause. A delicate balance of these messages are essential. What does one lose by moderating excessive inflammatory responses? Control inappropriate levels of inflammation, and improve the quality of life of those with blood disorders, and most other diseases. [Please look for future posts on other blood disorders such as sickle cell anemia, pernicious anemia, and idiopathic thrombocytopenic purpura (ITP)]. There is no cost to readers of these posts to speak with Dr. Hellen. She can be reached at 1.302-265.3870 [USA] or contacted at: drhellen@drhellengreenblatt.info . People with serious lung problems who are unable to breathe for themselves, for example, patients in intensive care units recovering from injuries, or who have viral, or bacterial infections, like pneumonia, may be placed on mechanical ventilation. Although these patients may require a ventilator, too often these devices make their lung conditions worse. Patients with lung injuries that require mechanical ventilation lead to more deaths annually than do breast cancer and prostate cancer combined. For years, scientists have known that when lungs are exposed to rhythmic pressure of ventilation, the production of cytokines, immune messengers, are stimulated. This excessive production of cytokines results in “boosted” levels of inflammation in the lungs that may damage the lungs, even after ventilation has been stopped. Excessive inflammation can lead to the destruction of formerly healthy organ systems. It is as if the immune system sees “pressure” as a “foreign agent” an event against which the body much be protected. The pressure appears to trigger an immune inflammatory response in the body. This phenomenon can be seen even at the cellular level. Exposing cells in a test tube to as few as four hours of rhythmic pressures results in increased levels of inflammatory cytokines that recruit more inflammatory immune cells into the area. Twelve (12) hours of ventilation-type treatment results in a 5-7 times increase in the levels of inflammatory cytokines. During winter months, respiratory infections are the most frequent cause of intensive care unit hospitalizations for infants. For some infections, Infants that are on mechanical ventilators have significantly higher levels of lung inflammation than infants not being ventilated. However, even in healthy children, mechanical ventilation triggers an inflammatory response within hours. For over a decade I have tried to educate the public about the need for the body to maintain immune inflammatory homeostasis, immune balance; having enough inflammation to do the job, but not so much that it causes damage. Inflammation is necessary for our survival to protect us from infections, and it is the first step the body takes when it heals itself, for example, after an injury. But the amount of inflammation produced by the body must be tightly limited, because too much inflammation is like an uncontrollable forest fire. One of my greatest frustrations has been trying to help medical practitioners understand that inappropriate inflammation is the foundation of most of their patients’ problems, but too often, “they just couldn’t get it”. Now, every journal, every magazine touts the fact that “inflammation is the root cause of disease”. They admit that it has a role in cardiovascular disease, gastrointestinal, emotional problems etc. and that inflammatory responses play a major role in cancer. It has been my experience that when individuals have major health issues, “following the levels of inflammation” will help explain what is happening to the patient. In cases of mechanical ventilation, other procedures and conditions, what would be the harm in taking steps to limit uncontrolled levels of inflammation, and help return the body to immune homeostasis? Dr. Greenblatt looks forward to assisting you in returning to immune balance: She can be contacted at: http://drhellengreenblatt.info/contact-dr-hellen or 1.302-265.3870 [USA, ET]. Thank you. An injury requires enough inflammation to start the healing process, but not so much that it starts a cascade of immune inflammation that causes damage to by-stander tissues. Cytokines are immune factors generated by white cells that initiate pro-inflammatory (inflammatory) responses and anti-inflammatory responses in response to infection or injury. A healthy person produces appropriate levels of these factors depending on the challenge it encounters. A body in immune homeostasis will either up-regulate, increase immune inflammation, or down-regulate, limit its inflammatory responses, depending on the body’s needs. Non-Steroidal Anti-Inflammatory Drugs (NSAIDs) Doctors often suggest non-steroidal anti-inflammatory drugs (NSAIDs), including aspirin when a patient complains of a sprain or other work- or sport-related injury.. These pharmaceutical compounds inhibit the production of immune inflammatory molecules such as cytokines. Limit the amount of inflammation and its resulting pain and stiffness are decreased. The problem is that many of these medications put people at risk of significant digestive, cardiovascular, kidney, and muscular/skeletal problems. For example, according to the American College of Gastroenterology, the regular use of non-steroidal anti-inflammatory drugs is the major cause of potentially life-threatening ulcers and stomach bleeding. Also, some practitioners question whether the use of NSAIDs may be the cause of increases in osteoarthritis and the high level of knee and hip replacements. Because of concerns about health risks, some health practitioners physicians suggest complementary, more natural methods, to decrease pain and inflammation, and perhaps even prevent damage from muscle injury. Glucosamine: Glucosamine is a natural substance produced by the body that encourages cartilage regeneration and the production of synovial fluid that helps “lubricate” the joints. There is evidence that glucosamine has anti-inflammatory properties. Omega-3 Fish Oil: Omega-3 fish oils have been shown to have anti-inflammatory properties and help the body control pro-inflammatory cytokines and the pain that results from up regulating, increasing, inflammation. Vitamin D3:Vitamin D appears to affect immunological function such as inflammation. Vitamin D supplementation has been found to provide therapeutic relief. Hyperimmune Egg: Hyperimmune egg, an all natural, food-based ingredient, is another approach to helping the body return to immune inflammatory homeostasis. In a study conducted at a major hospital in NYC, individuals on hyperimmune egg for 30 days reported higher levels of joint comfort. When certain types of glucosamine are added in combination with hyperimmune egg, joints appear to heal more rapidly and individuals report changes in their quality of life. When experiencing sprains, strains, or other injuries due to work, sports, or accidents, one might wish to consider the use of complementary ingredients prior to starting on prescription medications. Exercise is essential for workers such as firefighters and paramedics that have physically-and emotionally-demanding jobs, and is mandated by most departments. According to a study by the University of Arizona, Tucson, AZ and the Johns Hopkins Bloomberg School of Public Health, Baltimore, MD, 30% of the strains and sprains that firefighters and paramedics experienced, happened as they were working out. Seventeen percent of injuries, and almost half of time off work for injuries, were caused by strains and sprains resulting from workers carrying individuals. 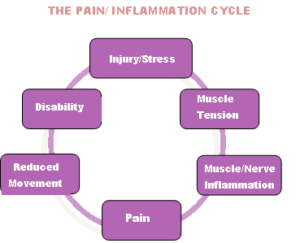 Pain and inflammation “feed one another”. Pain triggers more inflammation and inflammation leads to more pain. It is not clear how the body senses pain, nor biochemically, the exact events that lead to the sensation of pain. We know however, that pain signals from our back or limbs travel along nerve cells to the spinal cord and up to the brain, and that inflammation in the spinal cord and brain is either the direct cause of pain, or a major contributor to pain sensations that we experience. When muscles and tissues are injured, immune cells respond by entering the area and releasing cellular factors (e.g., cytokines) that will up-regulate inflammation as a way to help the body heal. However, it is as important for the body to decrease its inflammatory responses after a challenge is met, as it is to increase the response in the first place. Decreases in inflammatory responses, down-regulation, result from the production of different amounts of anti-inflammatory cytokines and their ratio to pro-inflammatory cytokines that cause inflammation. It all about the appropriate balance of immune responses, immune homeostasis.